As you know we are living with Bilge Rat's cousin. He is living in North Shore City, once an independent city next to Auckland, now a governmental district within Auckland. You reach North Shore City as soon as you cross the long harbour bridge over the sea. It's really close to Auckland and a 30 minute bus ride, usually takes you to the centre. But it is less crowded and you see more nature and parks, so it is a pretty nice place to live. We then took the car and visited some more beaches further north, including the furthest north: Long Bay, which is already in a nature reserve and not only especially long, but also especially beautiful. After enjoying the beaches, we visited Devonport Hill, another highlight of North Shore City. 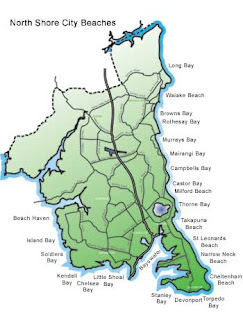 Devonport is facing the Auckland sea in the very south of North Shore. From the top of the hill you get a really nice view on central Auckland. Also there are a lot of military installations left on the hill, which you can explore. In WW2 after Japan's expansionism reached as far south as Australia, New Zealand also feared a potential Japanese invasion and fortified it's harbours. Due to Perl Harbour the Japanese could never fully invade Australia and thus never reached New Zealand, but the military fortifications still exist. There are some harbour artillery, bunker and a net underground passages and rooms. And you can freely explore all of it! Pretty cool. Finally we went to huge inland lake Pupuke, another highlight of North Shore City. This giant lake offers nice views, a variety of ducks in large numbers and nice meadows for picnics and relaxing. On the shore you can also find a really scenic old pumphouse, which now serves as a restaurant. That concludes our exploration of North Shore City! Thanks a lot to Bilge Rat's cousin's aunt for leading us around. It was a really pleasant change from the concrete of downtown Auckland. And we have to admit that at least this part of Auckland has some really nice sport for retreating!